Oh, my gosh. Prepare yourself for one fantastic drool-worthy dessert! 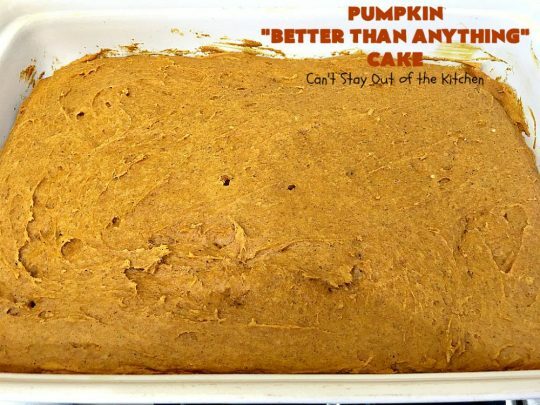 Pumpkin Better Than Anything Cake. Yep. 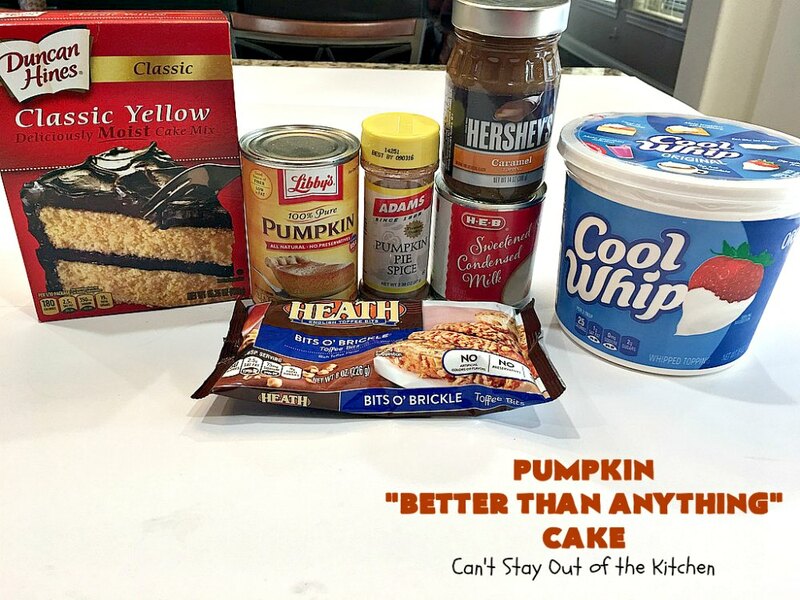 This luscious poke cake uses a boxed yellow cake mix that’s mixed with a can of pumpkin and pumpkin pie spice. After that’s baked, holes are poked into the cake and a can of sweetened condensed milk is smoothed over top. After the cake is refrigerated awhile, Cool Whip is spread over top. 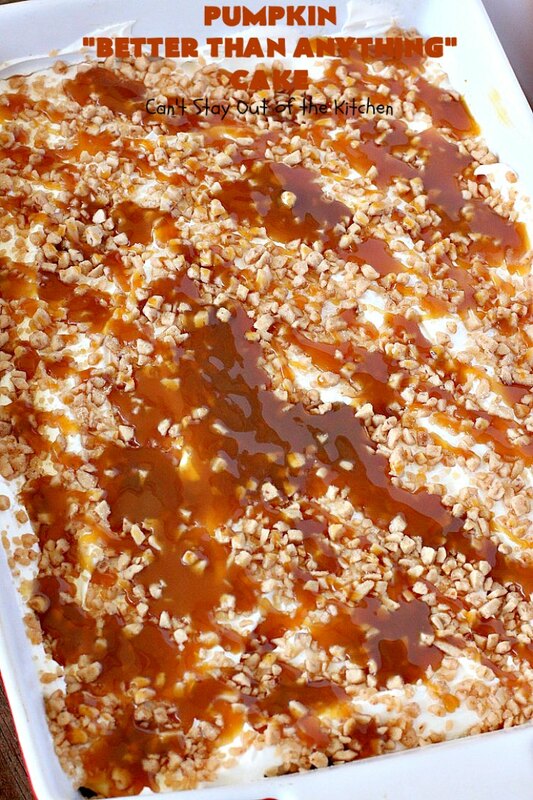 Then you sprinkle the topping with Heath English Toffee Bits and Caramel Sundae Sauce. Did I say this dessert is sensational? Back in late December, my husband came home with one of his usual “fantastic deals” from the grocery store. 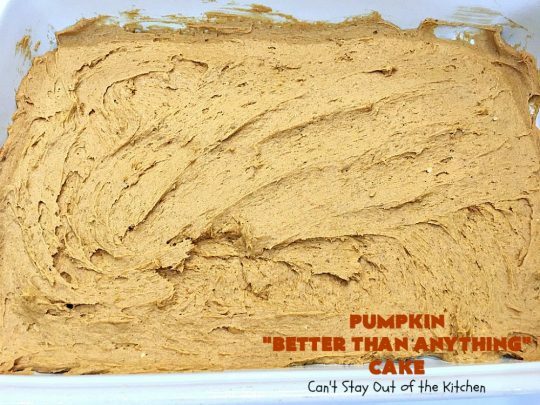 Fifteen-ounce cans of pumpkin on sale for only 10 cents a piece. He could not resist. He bought ten cans! 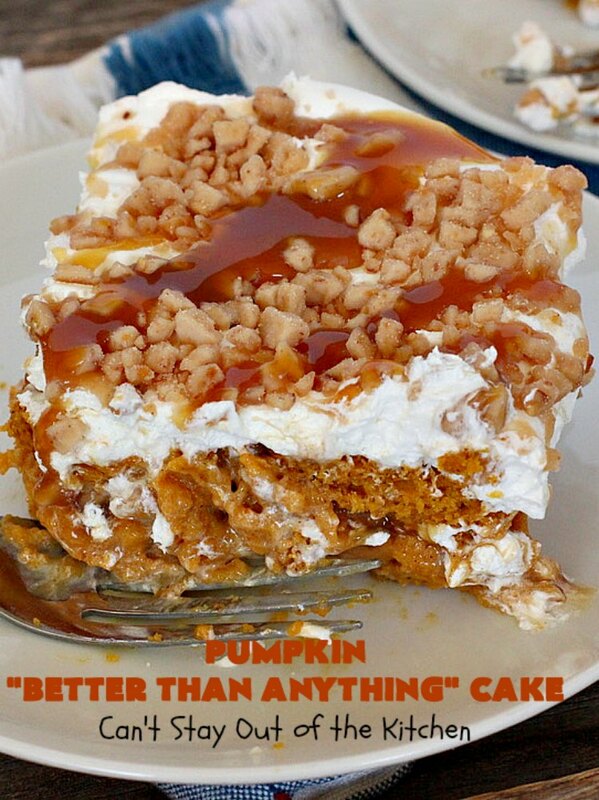 So I’ve been trying to come up with all kinds of ways to use that pumpkin. I’ve made Glazed Pumpkin Donuts, Pumpkin Toffee Cookies, Pumpkin Toffee Muffins and Pumpkin Chocolate Chip Muffins. I made two batches of this cake for John to take out to his office. I got some wonderful feedback about how much everyone enjoyed this cake. 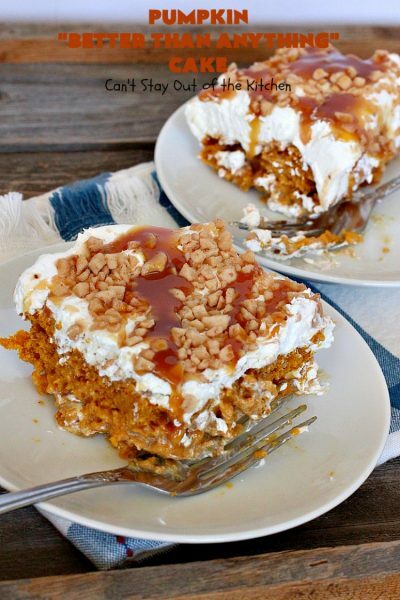 Really, what’s not to love with pumpkin, Heath English Toffee Bits and Caramel Sauce? Seriously, this cake is sensational. 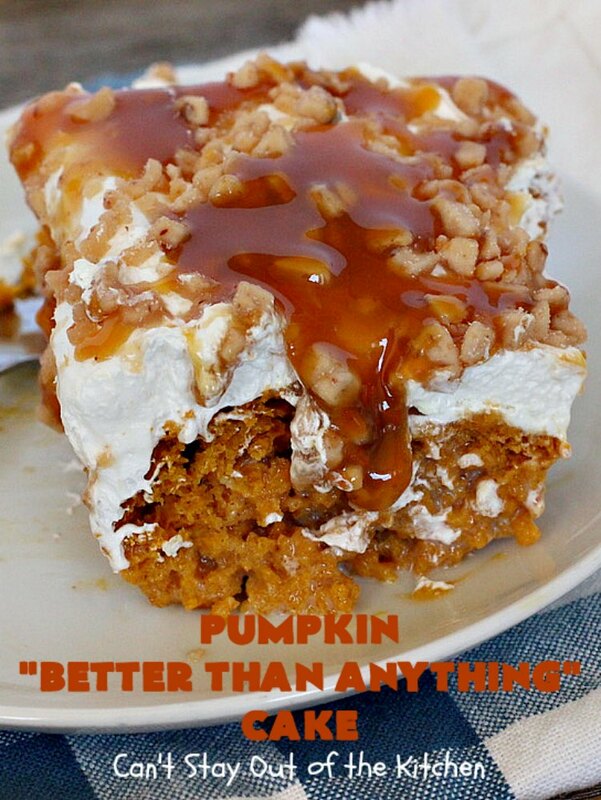 Back in the 70s and 80s “Better Than Anything” cakes were very popular. I have a vanilla version and a chocolate version that are scrumptious. But when I saw a pumpkin version, that was an automatic “go” for me. It was also a great way to use up some of that canned pumpkin. Pumpkin Better Than Anything Cake is one of the best desserts you’ll ever eat. 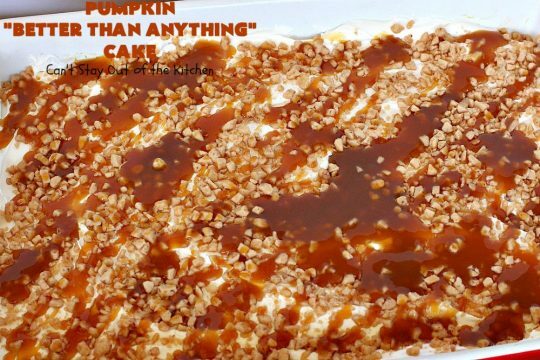 Caramel Sundae Sauce drizzled over the top makes this a spectacular dessert. 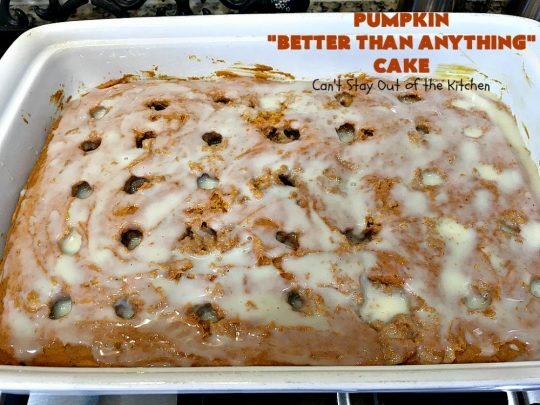 Every bite of Pumpkin “Better Than Anything” Cake will have you drooling! Pour cake mix into a mixing bowl. Add a can of pumpkin and pumpkin pie spice. DO NOT ADD EGGS, OIL OR WATER! 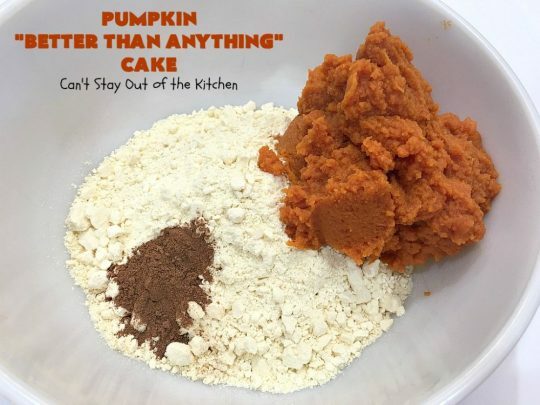 Mix with an electric mixer until ingredients are thoroughly combined. 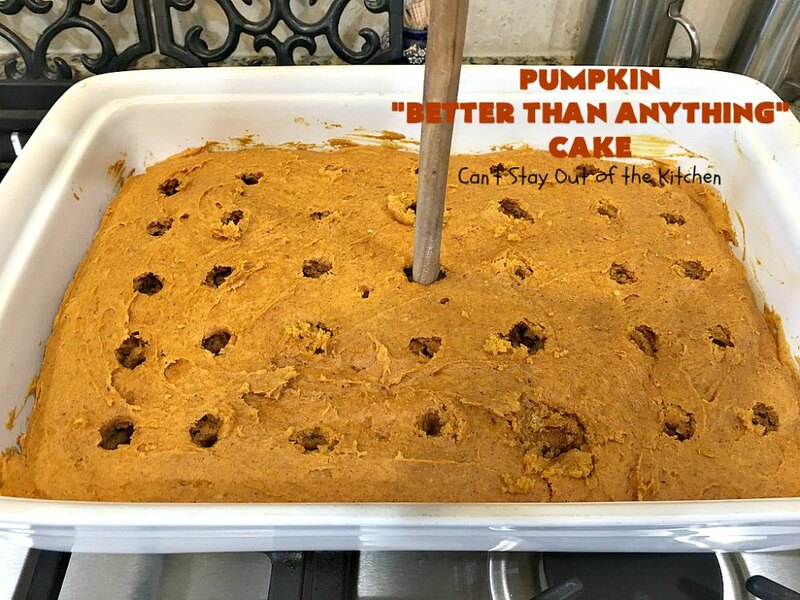 Spread pumpkin mixture into a greased 9×13″ glass baking dish. Bake at 350 for approximately 30 minutes or until a toothpick inserted in center comes out clean. Allow cake to cool for 10 minutes. Then poke holes in the cake with the bottom of a wooden spoon. Smooth the sweetened condensed milk over the top of the cake so it will absorb. 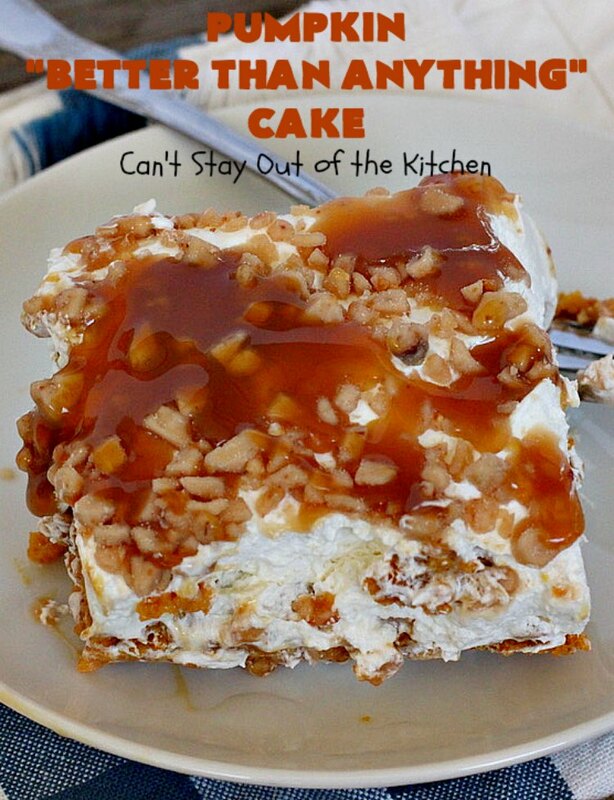 Refrigerate cake 30 minutes. 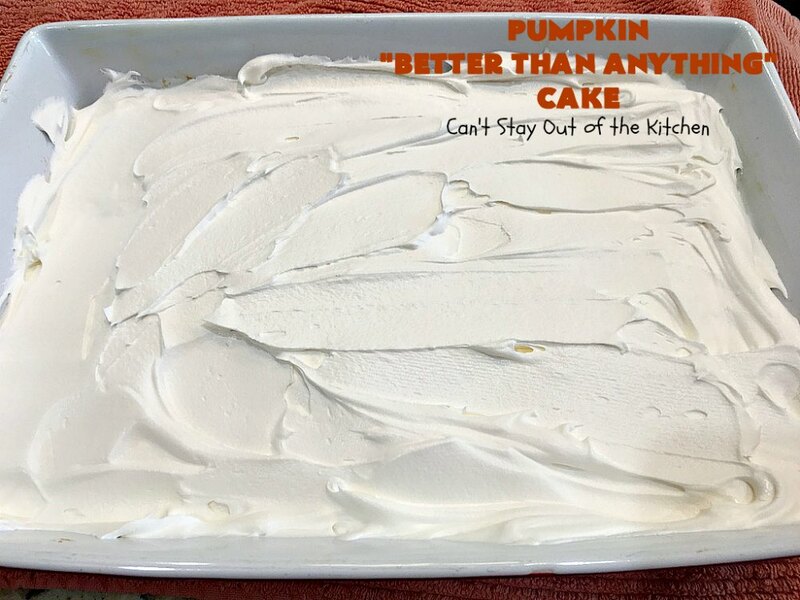 Remove from refrigerator and spread Cool Whip over top. Sprinkle half a bag of Heath English Toffee Bits over top. Drizzle with Caramel Sundae Sauce. Refrigerate several hours or overnight. Here’s what the interior of the cake looks like. Pumpkin Better Than Anything Cake is terrific for a company dessert. 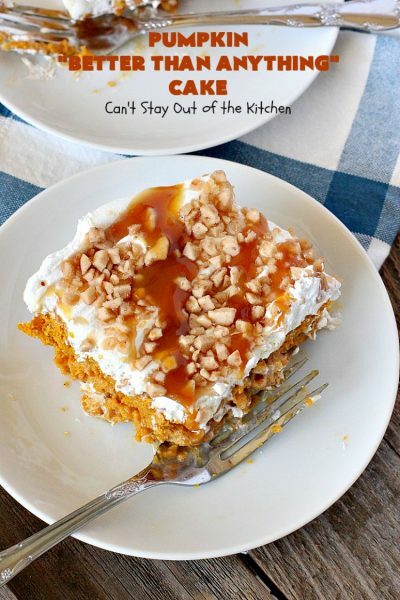 If you enjoy the flavors of toffee and caramel, you’ll love this dessert. Pumpkin Better Than Anything Cake is divine! This heavenly poke cake starts with a boxed cake mix mixed with pumpkin. After baking, condensed milk is poured into holes in the cake. Then it's topped with Cool Whip, Heath English Toffee Bits and Caramel Sundae Sauce. 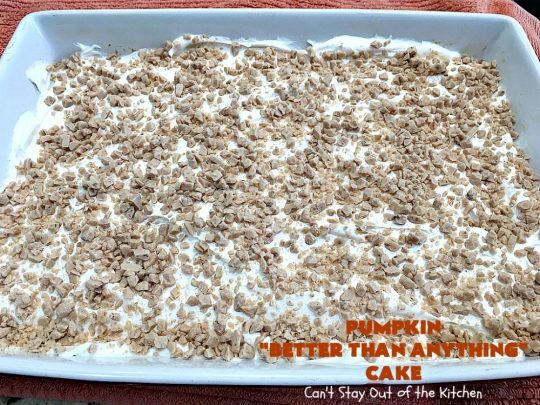 It is absolutely delightful and one of the best desserts you'll ever eat! Combine cake mix, pumpkin pie spice and pumpkin in a large mixing bowl until a smooth batter forms. Pour into a greased 9x13” glass baking dish. Bake cake at 350 degrees for approximately 23-28 minutes. Remove cake from oven and allow to cool about 10 minutes. With the end of a wooden spoon, poke holes throughout the whole cake. 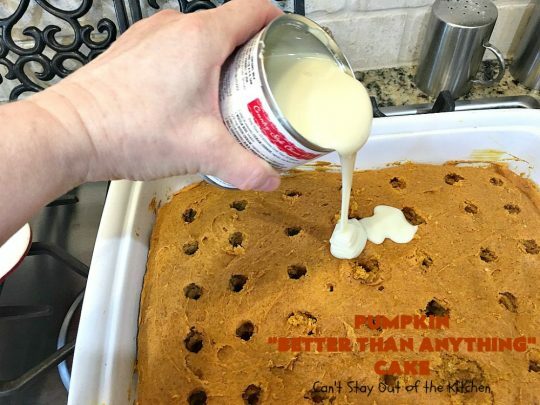 Pour sweetened condensed milk over top of cake holes and allow to absorb into the cake. 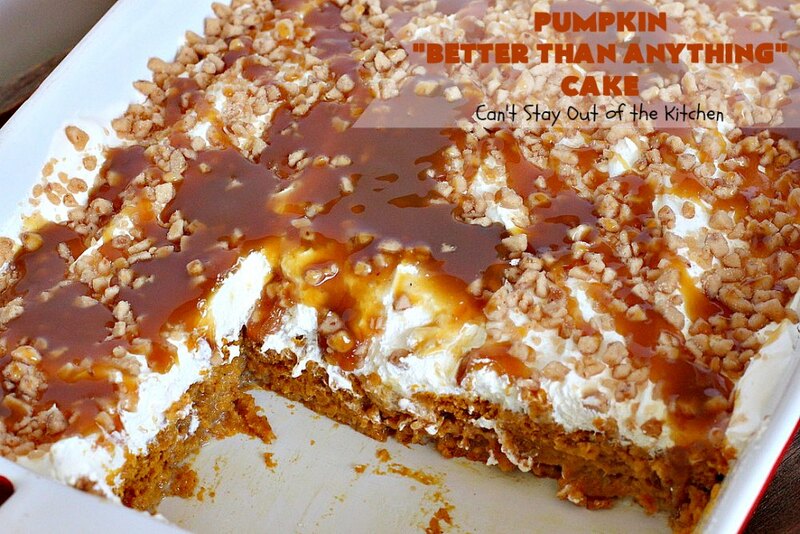 Spread Cool Whip over top of cake and sprinkle with Heath English Toffee Bits. 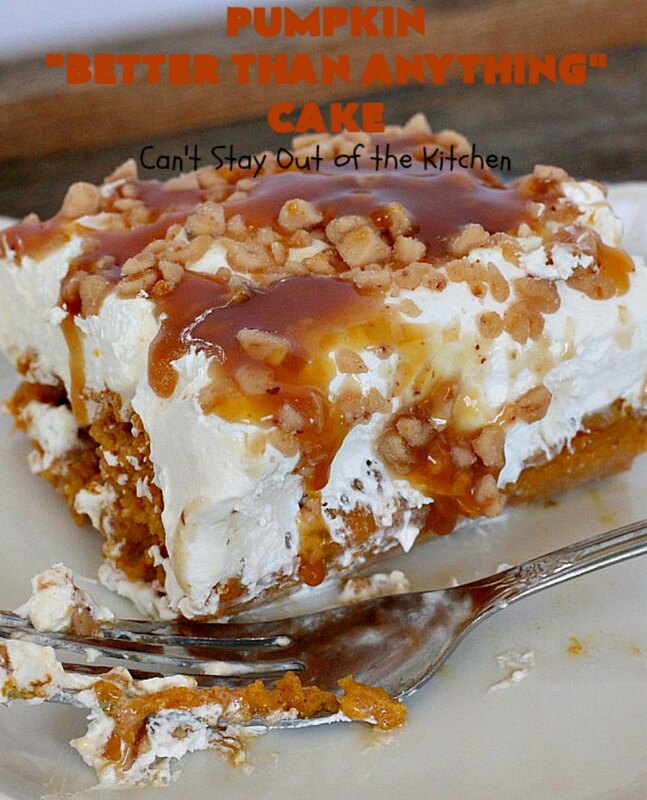 Drizzle caramel sauce over top of cake. Refrigerate 3-4 hours or overnight. NOTE: Heat caramel sauce in microwave to make spreadable. NOTE: I was baking two cakes at the same time. My cakes took almost 40 minutes to bake until a toothpick inserted in center came out clean. I rotated pans every 15 minutes. NOTE: Do NOT add eggs, oil or water when making cake layer. 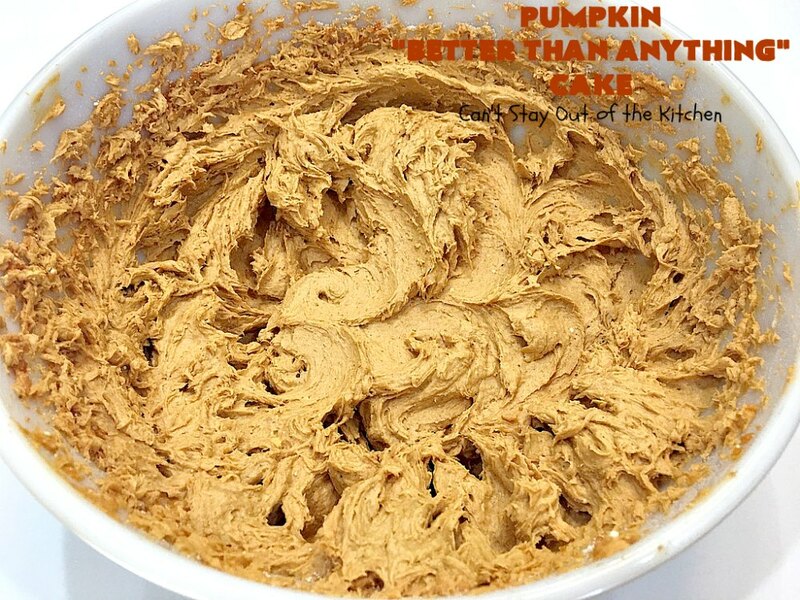 It uses only 3 ingredients: yellow cake mix, pumpkin pie spice and pumpkin. NO other ingredients. Recipe very slightly adapted from Clever Housewife. Grab yourself a fork and come dig in to this amazing dessert. I made two of these desserts and they both went fast at John’s office.